Categories: Krishna, Sri Swamiji's Kirtans. 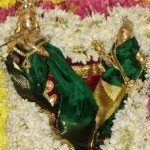 Sri Swamiji’s puja murthi is Lord Krishna and Radha who have manifested as Sri Premika Varadan and Sri Madhuri sakhi. Premika Varada means the one who bestows prema – pure and unconditional love. 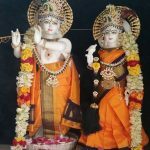 The Lord and His consort reside in the Madhurapuri ashram in Maharanyam village which is located about 50km from Chennai. Sri Swamiji has composed a beautiful set of 8 slokas on Sri Premika Varadan. The words and their meaning are given below. The One who bestows prema bhakthi, out of compassion, to the weak and pitiable! To that Premika Varada, I surrender! 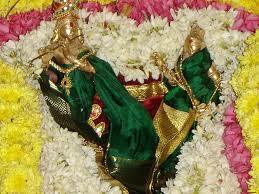 The One who always manifests in Sri Vanam (Brindavan) and plays divine lilas everyday in Madhurapuri! The One who accepts true devotees, blesses prosperity on the ones rendering service to Him and bestows happiness on them forever! The One who protects his devotees, just by that thought(sankalpa), wherever they are, whether in their own country or in foreign land! The One captivates the minds of the devotees with a mere glimpse of His form, the attractive one who excels Manmatha in beauty! To that (Lord) Premika Varada, I surrender. The One who carries the burden of his staunch devotees in this world and beyond effortlessly! The One who dances to the tunes of Hari Nama, and stands at the entrance to welcome his devotees who enter his altar! The One who through pastimes, seated on the throne with Madhurisaki, rules his kingdom of prema!